Which CRM is right for me? from small one person companies through to multi-nationals. We are happy to discuss your needs so if you need help or advice please call or email. Our "Pure Cloud" CRM is able to be Synced with Enterprise or Hosted for those who need a tablet or mobile access. Allows recording of information of companies and the staff who work there. Record phone calls, notes, meetings with the people you're dealing with to have a full record of your activities. Manage your sales pipelines - track sales, sales stage, value, add notes and make sure that your sales leads are all followed up. Manage customer support tickets inside CRM. Manage projects, tasks and effort within CRM. Send and track one on one emails or email campaigns, and send email campaigns via campaign monitor. Record email history in CRM including emails sync'd from outlook. Take voice notes and have CRM automatically record the audio, and convert it to text. See your data on google maps - customers, leads, sales and more. Gain insights into your data based on geographic location. Links with outlook to show crucial customer information from CRM at a glance when you receive emails. Allows the sync of contact and calendar data, as well as emails, with CRM. Tall Emu connects with many PBX systems to automatically log calls, as well as give insightful call popups when people call and also implements click to call. Save data entry time by connecting your CRM with popular accounting systems including MYOB and Reckon Accounts (Quickbooks). Full integration with Premier Classic to remove double entry of data and streamline business processes. Note MYOB is removing support for Premier Classic in 2019. Integration with Xero cloud accounts, sync companies contacts and more with CRM. Create and send quotes via Tall Emu CRM, transfer to complete invoicing. Email or SMS web based quotes to your clients that can be viewed, accepted and paid for online. 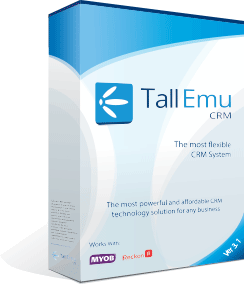 Manage Sales, Shipments, Invoices and payments through Tall Emu CRM. Transfer sales data to your accounting system to avoid duplicated data entry. Charge credit cards securely. Possible to implement recurring billing with stored credit card details in a PCI compliant manner. Create products and price lists in CRM. Manage custom fields and data structures in CRM to completely tailor the system's data capture capabilities to suit your needs. Create custom reports with our powerful built in reporting engine. Submit data directly from your website to CRM; automatically creating contact or lead records and use auto-responder technology to follow up. Track visitor engagement on your website and display visit data within CRM. Automate repetitive or recurring tasks using our powerful business automation engine. Manage your purchasing and importing from overseas. Manage stock in CRM. Import stock levels from the accounting system too, and see at a glance stock availability. Track and manage shipment of your goods. We have API's to several shipping partners to help streamline dispatch processes. We have an integration to Australia Post that allows submitting of consignments, label printing and manifesting without re-keying of data. We have an integration to StarTrak that allows submitting of consignments, label printing and manifesting without re-keying of data. We have an integration to Fastway that allows submitting of consignments, label printing and manifesting without re-keying of data. You can configure your own couriers or ask us to integrate to your preferred partner. Manage training courses, attendances and outcomes in CRM. Link with Moodle is coming in 2019!